If the blue does exist in Cuba, you would assume it is a minority interest. Or else it has adopted Latin colours for geographical, if not commercial, survival. But what is the real picture? 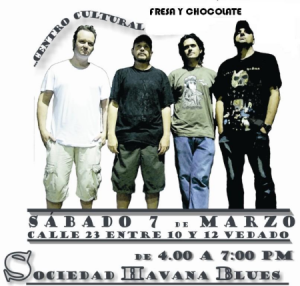 A brief internet search of blues in Cuba brings up the link to a vibrant website called Sociedad Habana Blues (Havana Blues Society). You might imagine this is the home of a special interest organisation on the island. And in a sense it is. But while it promotes blues music – largely through it’s associated radio show – it is primarily the roost for a working blues band of the same name. The site’s editor is the band leader and blues DJ, Migue de Oca (above). We met up with Migue in the centre of Old Havana. Six years ago Migue started broadcasting La Esquina Del Blues (The Blues Corner), a radio show promoting blues from around the world. Which is why his weekly selections are not exclusively in the English language. The programme is broadcast not only on national radio, but also to the rest of the world via the internet. It goes out for one hour every Sunday at 9pm Cuban time on Habana Radio. I have broadcast blues by some really great bands from places like the Basque Country in Spain and from Hungary, Migue explained. They sing some songs in English, but more usually in their mother tongue. We asked Migue why, amidst such a rich culture of Latin music, he fell in love with blues music. I grew up with my brothers during the Rock and Roll explosion of the 1960’s. In Cuba at that time, rock music was considered counter-revolutionary. It was hard for us, but younger people have a spark of rebellion. I only started to understand the heritage of Cuban music as I got older. Meanwhile I was desperate to understand the lyrics of bands like The Beatles, Jethro Tull and The Who. I was born in a small town called Cruces, Cienfuegos Province, in the middle of the island. We had one big turntable there and somebody used to bring back low-quality vinyl LPs from Havana. They didn’t even have labels on them. I think someone found some old American machinery and started reproducing the records in the city. Most of my friends didn’t like black music, but when I heard some BB King I thought it was great. If I ever get back my blue jeans, Lord how happy could one man be? Were there penalties for listening to Rock and Roll? In the 60’s there was a short governmental clamp down on hippies, long hair, blue jeans and intelectualism. But it didn’t last long! Through the 70’s however it was still considered inappropriate to listen to American radio stations. Our teachers knew we were secretly tuning-in. They used to hunt us around school! Did you have any personal favourites? My tastes evolved. In the late 70’s I listened intently to everything I could. I didn’t play; I just listened. I soon realised that blues was the mother of all the music I really liked. So I investigated it further. I also took up guitar. 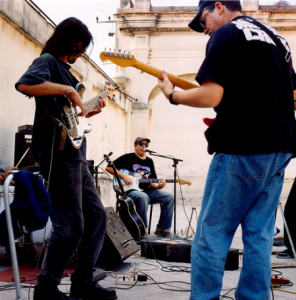 Then I started the Havana Blues Society (SHB) in the late 80s, with a regular jam session and blues fanzines. The fanzines soon stopped though, because I ran out of money! So how did SHB start? José Antonio from Canada made contact with me originally. He was our first harmonica player. Then came our Bass player from Spain. The three of us started the band. Then an American blues guitarist called Peter Bale joined us. He’d been living in Cuba for several years but I’d never heard of him! Our drummer, Fito Acosta, was in another band at that time, but as soon as he heard our stuff he jumped ship and joined SHB. A couple of our demo recordings were played on national radio, but after two or three years everyone moved back to their home countries. I tried out some other harp players, but in the end I decided to try it myself. Short of equipment, I asked Charlie Musselwhite and other friends if they could send me some harps. Migue took out one of Charlie’s Dannecker blues harps. You just can’t get harps here in Cuba. This one’s broken and I don’t have the tools to fix it. It’s from Denmark I think. We explained the heritage of the Dannecker family and Hohner harmonicas in the UK and are taking Migue’s Dannecker Blues harp back to England for maintenance. Does the band play regularly? We recently took an official government audition to become a licenced professional band. They compile a dossier about the band, complete with promotional material and present this to the Music Institute. Now we’re waiting for the official rubber stamp to get started. I spoke to them recently and they told me we’re next in line for approval. They were kind of sceptical when the audition started, but by the end they wanted to grab the guitar and join in! And who’s currently in the band? There are four of us. I’m on rhythm guitar, vocals and harmonica, Fito Acosta is on drums, José de Zárate from Spain is on bass and Steinar Seland from Norway is on lead guitar and vocals (thank goodness). 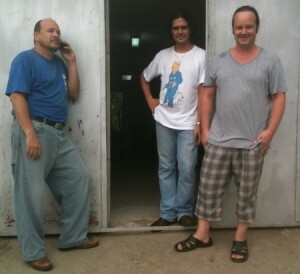 José and Steinar both married Cuban women and moved to the island a few years ago. We rehearse in Steinar’s garage and on the second Friday of every month at 7pm we run a blues jam at a local disused ceramics factory. 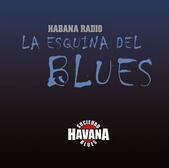 But if anyone is visiting Havana, email me at laesquinadelblues@habradio.ohc.cu and we can organise a jam anytime. We also organise a festival in December called Blues del Sur (Blues in the South). This year it is planned for December 17th-19th. Migue talked fondly about one particular native harmonica player. We have a great harp player in Cuba I wish you could meet. His name is Lázaro Morúa. Man he can play anything and he uses some of Howard Levy’s techniques. He’s a real musician. He reads music and can play on any kind of harmonica. He’s not from this planet. Like Carlos del Junco! 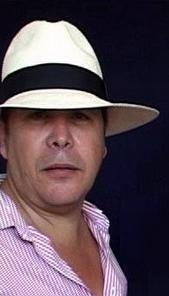 Lázaro played with Los Van Van, a world famous Cuban band and toured Europe. His singing range is astonishing and he’s done lectures on all kind of mucial styles and instruments, including the harmonica. He’s even written an unpublished study method for the harmonica has been involved with another famous Cuban jazz orchestra called Irakere. Migue contacted Lázaro who agreed to meet with us the following day. Sadly he didn’t show up. But Migue wasn’t surprised. He has a Bohemian streak, Migue added, we’ll try again next time you’re in Cuba! Migue played some amateur video footage of a jam session with Lázaro. It was hard to determine how expert his harp playing is, but his voice is certainly redolent of Bobby McFerrin. 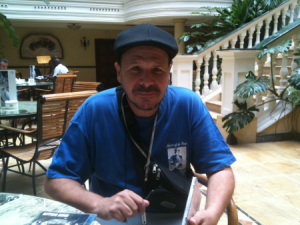 We’ll bring you more news from Migue, Sociedad Habana Blues and Cuba again very soon. In the meantime show him your friendship by emailing the address above and check out this video of the wonderful Sociedad Habana Blues.